"Metempsychosis" sculpture by design senior Nathan Daniel. Larger image. Photo by Alison Weidemann. AMES, Iowa — There are no jingle bells or red nose, but passersby have been doing a double take when they catch sight of a solo red deer stag on the east lawn of the Iowa State University College of Design. They soon discover that the stag is inanimate, a larger-than-life sculpture made of scrap steel from agricultural implements. Titled “Metempsychosis” (the transmigration of the soul from one body to another after death), the sculpture is an independent-study project by Nathan Daniel, an ISU senior majoring in design. The Lohrville native began his project two weeks into fall semester under the guidance of James Spiller, lecturer in architecture and design. He obtained permission from a John Deere dealer to sort through its salvage dumpster for parts that were going to be recycled, and he collected broken and discarded items from his family’s and neighboring farms to use for his project. Daniel went home most weekends this fall to work on the sculpture in his family’s heated shop. Initially he planned to create a wolf, but over Thanksgiving break, he began to think the body would work better as a deer. Daniel finished the piece Dec. 8 and a crew from the university’s facilities planning and management department helped install it with a skid loader Dec. 10. The completed sculpture is about eight-and-a-half feet long and ranges from 18 to 24 inches wide. From the ground to the top of its head is five-feet-eight-inches, with the antlers adding another two feet, nine inches. It weighs an estimated 700 pounds. The stag will be on display through Dec. 21, when Daniel will graduate with a bachelor of design degree. He plans to work on the family farm through the winter while searching for a job that will be the right fit for his diverse set of interests, he said. 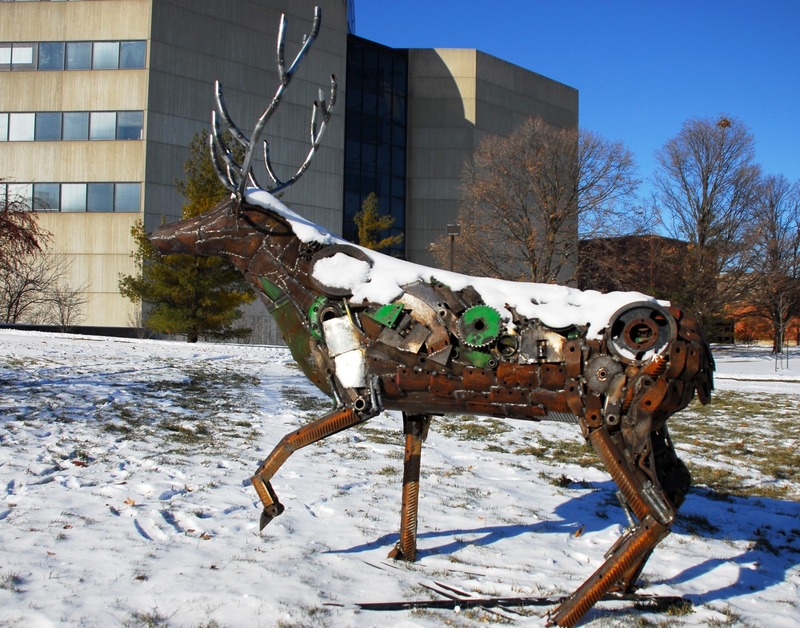 A larger-than-life sculpture of a red deer stag made of scrap steel from agricultural implements sits proudly on the front lawn of the College of Design until Dec. 21. The sculpture “Metempsychosis” is an independent-study project by Nathan Daniel, an ISU senior majoring in design. Detail of sculpture's scrap steel.